"We didn't want him to just go away someday and never be recognized for what he's brought to the school. The climate and culture here, he just elevates it." When seniors at Westbrook High School (WHS), eleven kilometers outside of Portland, Maine, don their caps and gowns and stream into Merrill Auditorium on June 8th in order to receive their diplomas one of their most illustrious classmates will not be amongst them. Not surprisingly, his rather conspicuous exclusion from the ceremonies has engendered considerable speculation, not to mention idle gossip. Of all the plausible explanations advanced so far, a lack of intellectual acumen has not been one of them because he is widely regarded as being one of the brightest bulbs on campus. Also, since he is well-liked by most of the teachers it does not seem likely that one of them has given him the shaft. His gentlemanly manners and unimpeachable personal conduct also make it doubtful that disciplinary problems could be the reason that he is being held back for another year. Although there has been some speculation that he fails to apply himself to his studies, that seems spurious in that he shows up bright and early each school day at 7 a.m. While it is true that he occasionally has been caught nodding off in class, that is hardly conclusive in that he very well could be, like Dame Agatha's Colonel Ephraim Pikeaway, most alert when he appears to be sound asleep. Other critics have cited a total lack of ambition on his part but, even if true, that would hardly be a crime in that successful scholars have seldom amounted to anything in this world other than propagandists for the capitalists and militarists. It therefore is entirely conceivable that ethical considerations have precluded him from taking a diploma and subsequently venturing out on his own in order to make his way in a thoroughly corrupt world. A far more plausible explanation is that he simply enjoys attending high school. After all, he has been doing so for the past fourteen years. It therefore should not come as any great surprise that his name is Simba and he is a ginger-colored tom who is estimated to be somewhere between sixteen and nineteen years of age. He arrived unannounced and unheralded at WHS in 2000 and has been gracing its hallways, classrooms, and various other venues ever since then. Over the course of the past fourteen years thousands of students as well as dozens of teachers and staffers have come and gone but he has been the one constant in Westbrook's ever-changing kaleidoscope. The old brick and mortar facade that WHS presents to the world as its public face will doubtlessly outlast him, but it is precisely Simba who is the school's heart and soul. Although she has not publicly explained what exactly it was that prompted her to befriend Simba, it is conceivable that in being new to the job she was feeling a bit insecure and therefore needed the special type of nonjudgmental moral support that only a cat can provide. Regardless of her motivation, that act of kindness on her part allowed Simba to get his paws inside the schoolhouse door and he then did the rest all by himself. Even since then Simba has been a fixture not only in Soucy's math classes but Gousse's office as well. He also is known to pay regular visits to the guidance office as well as to attend sporting events and band practices held on campus. The pièce de résistance, however, remains Soucy's classroom where he is not only fed and watered but allowed to sometimes stay overnight. She also provides him with rides home during inclement weather. "He's here very early in the mornings, and oftentimes stays through the night," she affirmed to The Bangor Daily News. "I'll sometimes find him curled up on my chair when I arrive in the morning." Whenever Soucy takes to the lectern Simba proves himself to be a rapt pupil even though there is some evidence to suggest that geometry is not his favorite academic discipline. "He just walks on (students') desks, lays on their backpacks and listens to the lessons," she related to The Bangor Daily News. 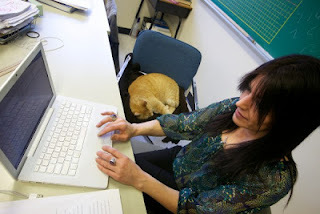 "Although one time, when I was teaching quadratic equations about four years ago, he covered his face in his (paws)." As is the case with cats wherever they choose to venture, not everyone is enamored with his presence. "He'll show up in class and sit on people's textbooks and just intrude," Kim Larley, who was scheduled to have graduated last year, groused to WMTV in the article cited supra. "He's cuter when he sleeps." Generally speaking, however, the calming effect that he has on most individuals is appreciated all across campus. "(For) most people, it's human nature. Animals are very warm," Gousse testified to WMTV. "They're calming. They bring a sense of peace." Art teacher Carol Connor wholeheartedly concurs in that assessment. "I just see such an emotional connection and real care about this creature," she told WMTV. "He has such a calming effect on all of us." Victoria Simoneau, who graduated last year, learned firsthand from Simba how to be both productive and relaxed. "He kind of sets the tone and reminds us that we don't have to be stressed," she told WCSH-TV of Portland on April 5, 2013. 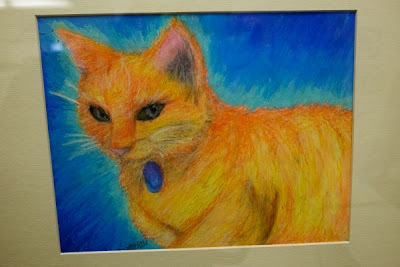 (See "Westbrook High's Unofficial Mascot Is the Cat's Meow.") "We can be as relaxed as Simba and still get stuff done." Attending classes at Westbrook is not all fun and games for Simba, however, and with ailurophobia being as virulent and widespread as it is, the school has deemed it necessary to place certain restrictions on his movements. 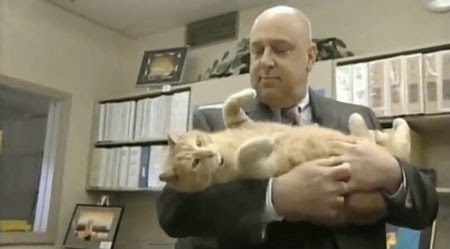 For example, he is not allowed near students who are allergic to cats. 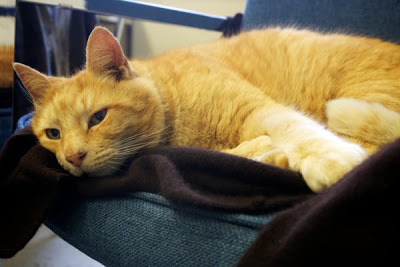 Even though that policy must make life difficult for him at times, it is still far less draconian than the expulsion order that the United States Postal Service in Notasulga, Alabama, issued to an elderly orange-colored cat named Sammy in January of 2009 after a female patron complained that she was allergic to him. Unlike so many cats who seek sanctuary at public institutions and establishments, Simba is by no means homeless. Rather, he lives with Eileen Shutts at 42 Monroe Avenue, which is only slightly more than two-tenths of a mile removed from the WHS campus at 125 Stroudwater Street. Even that arrangement is somewhat troubling in that cats who are loved and wanted at home usually choose to spend a lion's share of their time with their guardians as opposed to engaging in endless roaming. In Simba's case, he quite obviously is getting something at school that he is being denied at home. Perhaps Shutts is either away from home during the day or is not sufficiently attentive to his emotional needs. The particulars of Simba's living arrangement are difficult to assess owing to the fact that press reports have not broached the subject of where he bides his time when WHS is closed, such as on weekends, during the Christmas holidays, and throughout the long summer months. The one exception to all of that would be Gousse who likely is at his post twelve months a year. All that has been disclosed is that Shutts gained custody of him in 2006 after a family named Foye gave him up and moved out of the neighborhood. It accordingly would seem logical that certain unknown deficiencies in the care that he received from the Foyes were at the root of his decision to adopt WHS as his alternative home. Therefore, by the time that Shutts had acquired custody of him it already may have been too late for her to have curtailed his roaming. As long as WHS elects to leave out the welcome mat for him there is not anything per se wrong with Simba continuing to spend his days on campus. The only known potential threat to his health and well-being comes from motorists in the small town of eighteen-thousand residents and even that depends upon the density of traffic, the vigilance of law enforcement personnel and, most important of all, the number of busy intersections that he is forced to cross during his daily commute. Since it is only a six-minute walk from his home to the school, he should be relatively safe so long as he stays on the sidewalk. Nevertheless, he is getting on and pretty soon both his hearing and agility are going to begin to desert him and once that happens the odds of him winding up underneath the wheels of a cat-hater increase exponentially. "I think he probably knows he's liked and loved, and it's mutual," Gousse declared to WMTV in the article cited supra. If he truly means that, he will take immediate concrete steps in order to better safeguard Simba's valuable, yet fragile, life. At the very least, Shutts should take it upon herself to see to it that he arrives safely at school each morning while it should be the responsibility of either Gousse or Soucy to make certain that he gets home unscathed at night. It is, after all, highly unlikely that any caring parent would send off a small child to school each morning by its lonesome and a cat is in far greater need of a chaperon than any child. Much more to the point, to knowingly allow a cat to venture out into vehicular traffic is an admission that its life is not considered to be worth very much. If neither Soucy, Gousse, nor anyone else connected with WHS can be prevailed upon to act out of either emotional or moral considerations, they at least should have enough bon sens to realize that Simba is an extremely valuable financial asset. For instance, both students and faculty members alike were able to sell to the public last April a collection of paintings, drawings, and photographs of him. That sale also garnered the school not only local but national and international media attention and none of that would have been even remotely possible without Simba. The media circus that ensued did, however, leave the star of the show a bit knackered. Also, since it is well established that no self-respecting cat has any interest whatsoever in posing for either artists or photographers, that trying ordeal surely must have contributed mightily to his exhaustion. 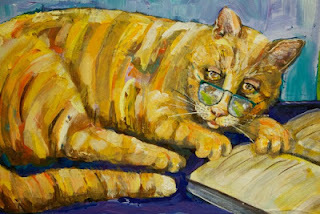 In spite of that, the effort likely was worth it in that the finished objets d'art not only raised money for the purchase of direly needed art supplies but, much more importantly, immortalized Simba on both canvas and in glossy prints. "It's been a rough week for him," Soucy acknowledged to The Bangor Daily News in the article cited supra. "He's famous now." So, too, is WHS. "It's just a little art show, but it's become a big story," Connor summed up to The Bangor Daily News. She additionally was grateful that Simba at long last finally had been recognized for all that he has done for Westbrook High over the years. "We didn't want him to just go away someday and never be recognized for what he's brought to the school," she added. "The climate and culture, he just elevates it." 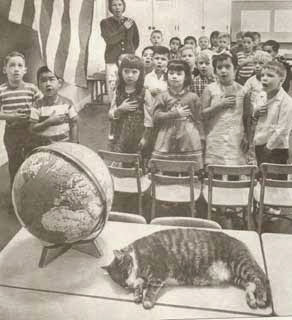 Much the same thing has been said over the course of the past seven decades concerning a wonderful, long suffering gray and white cat named Room 8 who from 1952 up until 1968 graced the classrooms and hallways at Elysian Heights Elementary School in the Echo Park section of Los Angeles. In addition to spreading cheer and good will wherever he went, he also shared students' lunches and was famous for inadvertently erasing blackboards with his tail as he pussyfooted through chalk trays. Unlike Simba, life was a hardscrabble affair for him. Born in 1947, he soon was forced to take to the streets after, apparently, having been abused at home. Shockingly enough, even during his long sojourn at Elysian Heights he was not permitted to live on the premises. He thus was forced to rough it most of the time although he did live for a while with a family known as Nakano and later at the residence of student John Hernandez. Despite his many hardships, he persevered and his notoriety soon spread far beyond the confines of Elysian Heights. For instance, in November of 1962 he was featured in Look Magazine and that was followed by an article in the Weekly Reader five years later. He also made an appearance on Art Linkletter's television show, "House Party," and was featured in a 1968 television documentary entitled "Big Cats, Little Cats." He is perhaps best remembered today thanks to a 1966 tome coauthored by Elysian Heights alumnae, principal Beverly Mason and teacher Virginia Finley, entitled A Cat Called Room 8. Amazingly, a few copes of this rare treasure are still available on Amazon for a pretty expensive penny. Following his death at the age of twenty-one on August 13, 1968 he was interred at Los Angeles Memorial Park in Calabasas where a three-foot-high granite tombstone featuring a likeness of him adorns his grave. 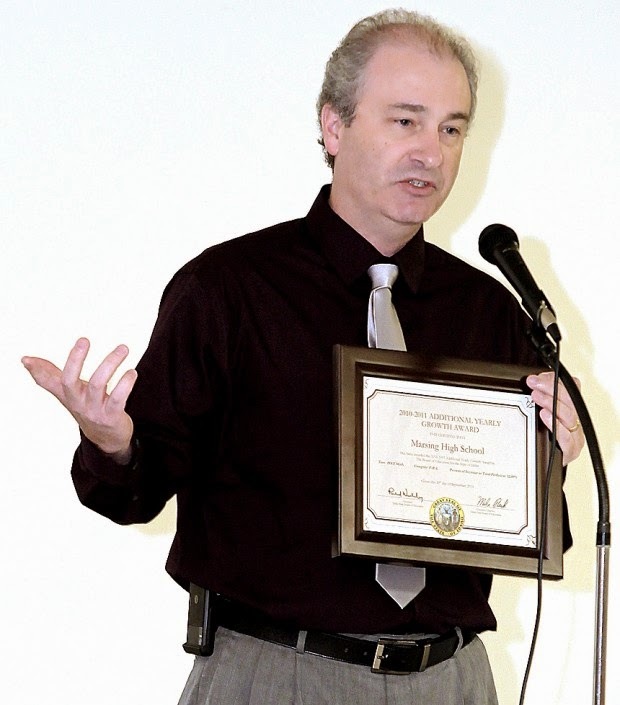 It is, however, in the memories of the students, faculty, and staffers at Elysian Heights who were fortunate enough to have known him during his all-too-brief existence that his presence is still felt the strongest. 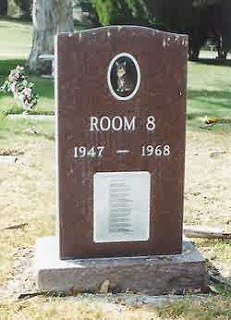 It nonetheless is not only sad but disturbing that apparently no one connected with Elysian Heights during the course of his long tenure there was willing to have taken personal responsibility for Room 8's well-being and care by providing him with a permanent and loving home. As a consequence, he was forced to spend countless nights roaming the forbidding streets of Echo Park cold, hungry, and lonely. The glaring omissions inherent in both Westbrook's care of Simba and Elysian Heights' abject neglect of Room 8 pale in comparison, however, with the criminal conduct of professional educator Wade Pilloud. For example, back in September of 2006 when he was principal at Indus High School in Koochiching County, Minnesota, he shotgunned to death a pair of five-week-old motherless kittens that were living on campus. Moreover, the reason that the waifs were without their mother is that earlier he had dispatched her to the devil via a kill trap. For that trio of cold-blooded, premeditated murders he was convicted in December of that year of only count of animal cruelty and one count of damaging school property. Local judge Chad Leduc only added to that travesty of justice by sentencing him to perform a measly twenty-four hours of community service as well as to attend anger management classes. No one should find any of that surprising because in America it is almost always the flotsam of the human race that not only endures but rises to the top of the dunghill known as society. Meanwhile, those individuals with so much as a scintilla of decency in their souls make it only about as far as a boomerang tossed into a whirlwind. "Droll thing life is -- that mysterious arrangement of merciless logic for a futile purpose. The most you can hope from it is some knowledge of yourself -- that comes too late -- (and) a crop of unextinguishable (sic) regrets." It is the latter part of that equation that causes all the difficulties and for that reason the quest for the eternal verities must, by necessity, be an ongoing process. Some of those individuals currently affiliated with WHS have taken a few, tentative baby steps on the long road toward acquiring an abiding appreciation for Simba. Like their colleagues before them at Elysian Heights, however, they still have an awful lot to learn. First of all, cats are in no way inferior beings; au contraire, the exact opposite is closer to the truth. "If man could be crossed with the cat it would improve man but it would deteriorate the cat," Mark Twain observed in his 1894 Notebook. Secondly, this world is a place of action, not mindlessly running off at the mouth. It accordingly is not nearly sufficient for personnel at Westbrook to claim that they care about Simba's well-being; rather, it is incumbent upon them to take concrete measures in order to vividly demonstrate that concern. As was the case with Room 8 and Elysian Heights, the fundamental inequities that characterizes Simba's relationship with WHS are impossible to ignore. Specifically, just about all of the benefits to be derived from their lengthy association have accrued to the school whereas Simba has been paid off in crumbs. Although he is said to be in good health, Simba soon will pass from the scene and once he is gone it will be much too late for Westbrook to make amends for its colossal omissions in its treatment of him. Furthermore, to rely upon artistic depictions, memorials, and memories as acceptable substitutes for failing to treasure the flesh and blood genuine article while it was still alive is, in the final analysis, just one more poignant example of man's selfishness, runaway egotism, and callousness. Photos: Tony R. Bennett of The Bangor Daily News (Simba by himself, Simba with Soucy, "Simba the Scholar," and "Sweet Soft Kitten"), AOL (Simba and Gousse), Find a Grave (Room 8 and his grave), The Chippewa Herald (Pilloud), and KSNW-TV of Wichita (Simba up close).